The AVG-UDA2 DA is a 4K HDMI splitter with the ability to transmit an HDMI or DVI source to two displays simultaneously. Compliant with HDMI2.0 & HDCP2.2, the AVG-UDA2 DA provides comprehensive resolution capability up to 4K, 1080p & 3D. It will also de-embed digital stereo audio from the HDMI and output the audio to two analogue audio outputs. 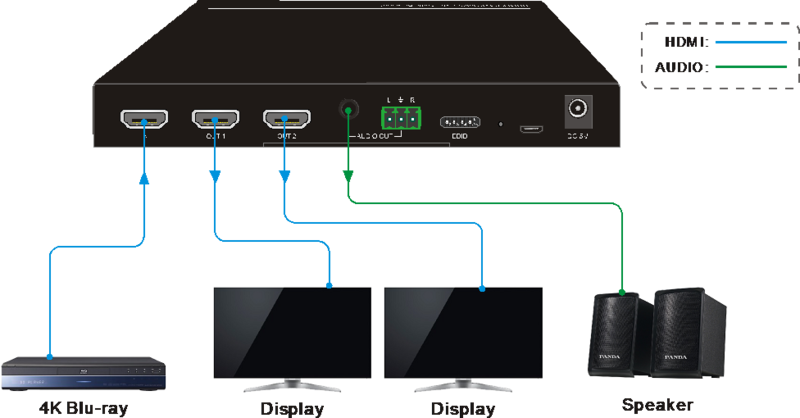 Fully compliant with HDMI2.0 & HDCP2.2. 5mm mini jack and a 3-pin Phoenix plug for audio de-embedding. Features smart EDID management. Multiple presets and customised settings allowed. Avation is a distributor of audio visual and control solutions for the custom installation industry servicing both the residential and commercial sectors. We supply all our products through an extensive dealer network throughout Australia and New Zealand. avation © Copyright Hicaliber Pty Ltd 2019. All rights reserved.